With Beasts of New York, the world’s most immortalized city acquires yet another fascinating identity. On the surface of this adventure story is a landscape populated by wild animals—largely squirrels, rats, cats, and birds, from whose perspectives Manhattan’s buildings are mountains, its rivers distant seas, and its automobiles terrifying death machines. Below, however, lies the far more sinister Kingdom Beneath (aka the subway system), with its endless pipes, foul odors, and labyrinth of tunnels, an unknowable realm in which our narrator loses—and then ultimately comes to find—himself. Patch is a squirrel living in the Center Kingdom (Central Park). His daily routine of navigating the sky roads (trees) in search of food and creating society with his fellow creatures seems familiar enough, but what’s peculiar is Patch’s ability to speak Bird, a skill that will ultimately render him a hero when his beloved surroundings are suddenly converted to a war zone by the fearful and greedy. The book’s tone shifts from humorous to horrifying and back throughout. Patch’s temporary exile to Staten Island while clutched in the talons of a hawk is amusing, as is the uptown attitude of his new companion by default, the “Queen of all Cats,” who lived on The Great Avenue (Park Avenue) dining on caviar and sushi before being abandoned to the most maligned borough. Frequent battle scenes (including arranged dog fights) are brutally rendered and suggest an audience of young adult and adult readers. In writer Jon Evans’s critique of modern society’s excesses, his beasts’ overall distrust of humans (excepting the homeless, who share their food) is understandable. But these are the same humans, it must be remembered, who created the highly contrived Central Park, the preservation of which forms the backbone of his story. More than anything else, Evans’s book is about communication, physical, verbal, and instinctual; about gossip, eavesdropping, and a series of messages sent, received, misinterpreted, and mistimed. How his various creatures find their “voices” in their moments of need and manage to be understood by each other and their enemies is artfully imagined and constructed. 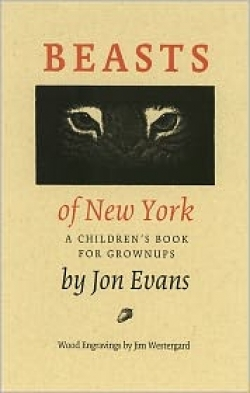 Through the eyes and hearts of Evans’s furry characters, Beasts of New York gets at a lot of complex stuff: issues of identity, specifically nature versus nurture, are explored without being heavy-handed, and the real-life distances between bravery and cowardice, loyalty and disloyalty, hope and despair are often revealed to be just a hair’s breadth apart. Beautifully engraved portraits of the main characters by Jim Westergard heighten our ability to empathize with them throughout the book.